S aint-Säens was an eminent French composer of operas, symphonies, symphonic tone poems, concertos, and numerous smaller works, as well as an organist and pianist of phenomenal ability. As a prodigy, he first performed in public at age 5 when he accompanied a Beethoven violin sonata, and his first composition from age 4 is preserved at the Bibliotheque Nacionale. At age 10 he played a major solo recital, formally launching a performance career which continued until 4 months before he died at the age of 86. He appears to be the first pianist to perform publicly the complete cycle of Mozart piano concertos. He is also the first major composer to write specifically for the cinema (The Assassination of the Duke of Guise, 1908). He was a man of many controversies and contradictions. He was sometimes disliked for being too progressive in his music, yet in his later years he was often dismissed as too conservative. He was a friend and admirer of Liszt, Fauré, and Wagner (though he later turned on Wagner), yet he railed against contemporaries Franck, Massenet, Richard Strauss, and most of all Debussy. Saint-Säens was noted for his sense of humor, and was gifted intellectually in mathematics, archeology, botany, and philosophy. He published works on history, science, and his extensive travels, along with his own poetry. He also edited and published the complete keyboard works of Rameau. 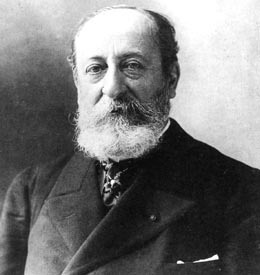 Saint-Säens, despite his many successes and worldwide acclaim during his long life, ironically is remembered most for a work he never allowed to be performed publicly during his lifetime, fearing its frivolity might damage his reputation as a serious composer. That work is Carnival of the Animals, an orchestral suite which he shared humorously only among friends, and which he refused to publish during his lifetime (except for “The Swan”). Today this work is one of the most beloved of children’s classics throughout the world, and is by far the most often performed of the composer’s large body of work. Camille Saint-Saëns’ witty musical suite is “his salute to feathers, fur, and fin.” Enjoy live animals from the San Diego Zoo as the Mormon Youth Symphony performs outdoors, with Gary Burghoff (from Mash) narrating the whimisical verses of Ogden Nash. The live orchestra allows kids to see which instruments are playing to characterize the different animals. Jim Gamble’s puppet version of Carnival of the Animals is well done for a toddler audience. Puppets help bring the poems and music alive. See Music in Motion’s Carnival of the Animals puppets and props . Carnival of the Animals poster.